Wireframes or depictions of facet arrangements (such as Fig. 4-02) are from scans of real gems so as to illustrate the certain aspects of gem cutting. In the previous installment of this series, we spoke about the many decisions and tradeoffs a cutter makes in order to bring out the most value in a colored gemstone. These choices can be about maximizing for weight or clarity or, more often than not, about maximizing for the king of all value factors: color. This chapter continues the exploration into gem color and value and digs deeper into the cutter’s decisions. As a value factor, we have mentioned color zoning and described it as any uneven distribution of color within a gemstone. Color zoning is often due to temperature changes or the uneven incorporation of certain trace elements during the gem’s formation, such as in these sapphires (see Fig. 4-01). Visible color zoning can range from minor to obvious. As with clarity, the location and contrast are important. If the cutter has hidden it well through careful planning of facet arrangements, there is little impact on value. 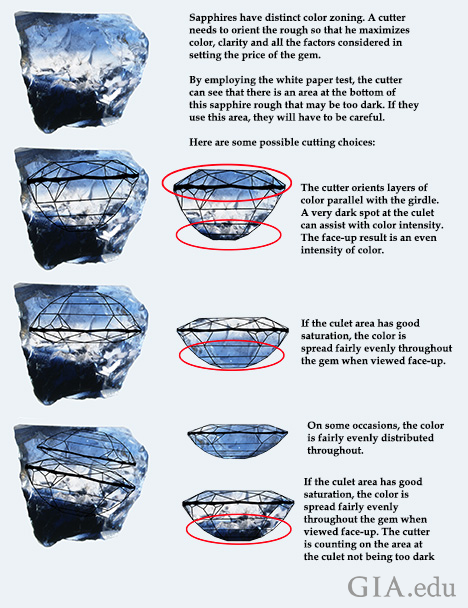 An experienced cutter mutes the face-up effects of color zoning by arranging uneven color zones to run parallel to the girdle, or by placing a small bit of concentrated color at the culet. Remember the native cut gem from Part 1 with the culet off-center (see Fig. 4-02)? This type of cutting used a spot of strong color that is placed at the culet, which spreads that color throughout the face-up appearance. That spot of color was not at the center, so the cutter made the culet off-center to use that spot of color to evenly distribute its effect. Re-cutting the culet to center will remove that spot of color and the final gem will have much weaker color. Sapphires are well known for their color zoning, which presents some challenges to the cutter (see Fig. 4-03). Many of the green sapphires from Australia and Thailand, when viewed under magnification, show that the green color is actually a function of blue and yellow color zoning. Some of these sapphires display interesting blue-green color zoning that is visible to the naked eye, and less expensive parti-colored sapphires (showing different colors, such as blue and orange, green and blue, etc.) have sold well in some markets. It is important to remember that many natural gems will exhibit some degree of color zoning, which is often an indicator of their natural origin. There are a few gemstones that are valued specifically because of their distinctive color zoning. Both ametrine (see Fig. 4-04) and some multicolored tourmaline (see Fig. 4-05) display well-defined zones of color. Ametrine combines amethyst and citrine in the same crystal, and the color zoning is due to differing oxidation states of iron within the crystal. The cause is believed to be temperature differences across the crystal during its formation. A gem with the color zoning that creates interesting patterns of contrast has higher demand in the market as opposed to the gem with blended colors. In these cases color zoning is intentionally displayed face-up. Gems that split light into two separate rays that are polarized into right angles to each other are called doubly refractive (e.g. tourmaline, peridot, and tanzanite). Singly refractive gems do not split light into separate rays (e.g. spinel, opal, amber, and diamond). In doubly refractive gems, each of those rays has a different refractive index measurement. The difference in the RI values of the two rays is called birefringence and is also a measured value. Gems like beryl (aquamarine), corundum (sapphire and ruby), or tourmaline are examples of gems that are doubly refractive but with lower birefringence. Those that have a large RI difference (such as zircon) are easier to spot; the facet edges appear doubled under 10x magnification. The blurred facet edges are associated with higher birefringence (over .10). There are two types of doubly refractive gems. In a uniaxial gem, there is a direction that behaves like it is singly refractive (light entering that direction is not broken into two beams) called the optic axis. Biaxial gems have two directions that act as an optic axis. The cutter should try to take this into consideration. As a general rule, the table of a doubly refractive gem should be cut exactly at right angles to its optic axis. There are notable exceptions to this and for a better understanding, read Richard Hughes’ article on pleochroism. A gem that is singly refractive, such as garnet or spinel, can be oriented in any direction when cutting. When light is split into two rays (doubly refractive), those two rays may emerge as different colors or, in two shades and intensities of the same color. Different parts of the spectrum are absorbed in the different directions causing the apparent difference in color. Examples of gems showing strong pleochroism are andalusite, corundum, spodumene, tourmaline, and tanzanite. Here the cutter needs to pay close attention to cut the gem so that it faces up with the best color. They can lower the potential value by introducing weak or less desirable colors. This cross-section of a sapphire crystal (see Fig. 4-06) shows common color zoning and the optic axis. Colors seen at right angles to the optic axis are frequently a different intensity or of a different hue. This is particularly true for sapphire, aquamarine, and tourmaline. Other times, mixing the colors in the face-up position is attractive, such as with tanzanite. 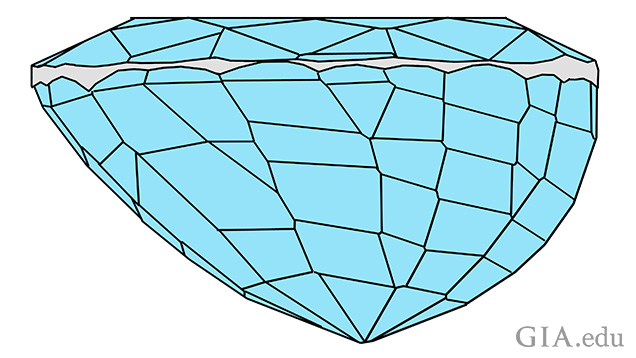 If a block of tanzanite was cut with faces perpendicular to the optical axis (see Fig. 4-07), each face would show a different color. Sometimes when tanzanite is cut the rough can be oriented so that when the colors mix, the face-up appearance can be improved as different colors blend so that we view them as one color. A CUTTER’S TRADEOFF: Cutters are often faced with a dilemma; weight retention or best color. The best color may lie in a direction of the piece of rough that will only allow recovering a couple of small gems, rather than cutting a large one but of weaker or less desirable color. The expected final weight and estimated selling price of the finished gems influences which direction is most profitable for the cutter. Green tourmaline sometimes has what cutters call a closed c-axis. This means that the optic axis absorbs all of the light entering the gem in that one direction and the result is a black opaque direction. In this case the cutter must cut at a right angle to the optical axis, even then the darkness will be reflected back into the gem. 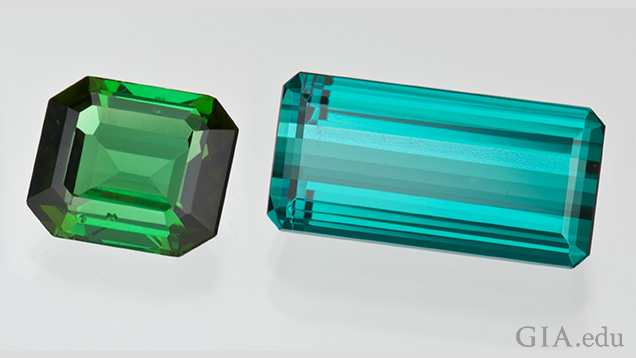 Figure 4-08 shows two tourmalines, the one on the left has a closed c-axis compared to the tourmaline on the right with an open c-axis. To mute the effect of the closed c-axis (on the left), most cutters would cut the end facets along the c-axis very steeply so that the black end is not reflected into the face-up position of the gem (not done in Fig. 4-08, which is why the ends are black). A CUTTER’S TRADEOFF: When working with a closed c-axis, choices are limited to step-cut styles and cutting the ends with steep angles. If the rough is an odd shape, it may be that the cutter has to introduce these dark areas of absorption rendering the color less desirable. 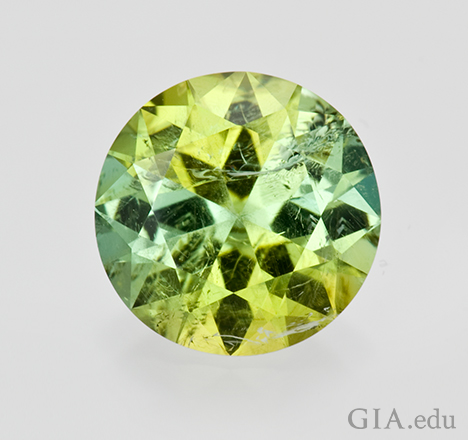 Strongly pleochroic gems cut in rounded shapes with the c-axis parallel to the table facet show a pleochroic “bow tie,” visible as blue-green and yellow-green in this tourmaline (see Fig. 4-09). A CUTTER’S TRADEOFF: Cutters must decide if the pleochroic colors will be attractive or diminish the potential value of the finished gem. For some gems, that’s easy. For tanzanite, they often try to bring together the two opposing colors, whereas for tourmaline the two different colors can create a less attractive gem. A CUTTER’S TRADEOFF: A uniformly colored piece of rough yields gems of different color intensity as the sizes and proportions vary. For example, a gem cut from light colored rough is considered attractive if it reaches a certain size to produce enough color saturation. If the rough seems quite pale, a cutter might plan for one large, deep gem rather than several lightly colored, well-cut ones. 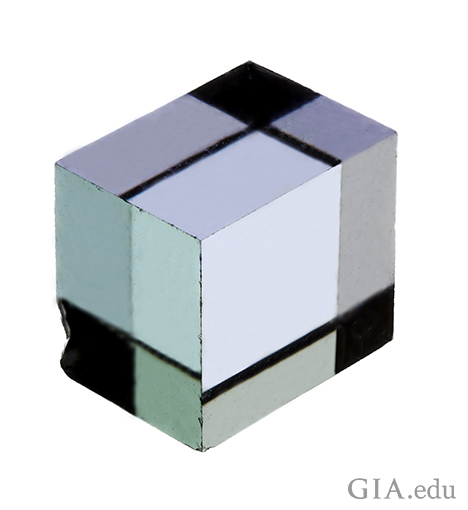 In Figure 4-10, there are four gems cut from material that is very evenly colored (only half the gem is shown because of space limitations). The largest two gems are too dark (left). The third gem has good color saturation and the last gem is starting to become too light. To achieve the best range of color, this large piece of rough should be cut in a range of sizes around the third gem (7.5 mm), probably from 6 to 12 mm. Face-up color is dependent upon a number of things, including orientation to mute the effects of pleochroism and orientation of common color zoning. The gem also has to have the right amount of color saturation. Increasing the gem’s size can increase the color saturation, both of which are dependent upon the features of the rough. There is no question that beauty is in the eye of the beholder, but gems have been faceted to attract our eye for hundreds of years. During that time, many forms have disappeared because they are visually less interesting. This section dealt with the heart of what makes a gem’s fashioning appeal to us (or not). We want to see vibrant color. We want to see an interesting visual pattern. Instead of settling for ‘good enough,’ ask yourself if the gem you are considering to purchase was cut to enhance the color, make it more vibrant, and ultimately create an interesting visual pattern. The gem should have some kind of ‘Wow’ factor. Up until now, this series has focused on the cutter’s service to the king of all value factors: color. But the cutter brings additional value to a gem through his or her artistry and attention to detail. A gem’s facet alignment and polish, as well as other areas of craftsmanship are what we turn to in our next and last installment. UP NEXT: Part 5: "What to Look For", we explore craftsmanship’s bearing on cut quality.